A Russian wannabe-Hercules has flaunted his jaw-dropping foot wide biceps after undergoing synthol drug injections. 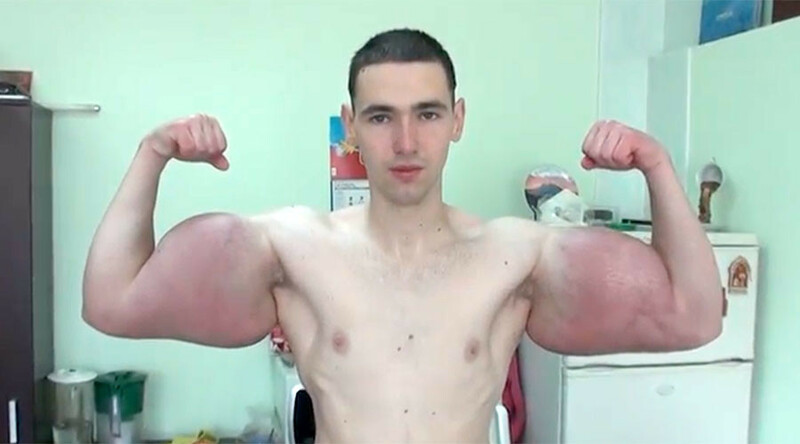 Kirill Tereshin from Pyatigorsk, Russia, proudly paraded the painful-looking results of the injections Saturday, a technique used by some bodybuilders to help them bulk up. The slender 21-year-old’s disproportionately bulging biceps measure 64cm (2ft) in circumference and are a somewhat disturbing shade of purple. Tereshin says the discoloration is a temporary side-effect, and that he built up his biceps after a month of injections. Stretch marks frame the biceps, which were achieved through a series of injections using a drug called ‘synthol,’ a blend of mostly oil (85 percent), painkillers and alcohol, according to the US National Center for Biotechnology Information (NCBI). Muscle expanding injections are becoming increasingly popular among men who want their physique to resemble that of a bodybuilder. Once injected, the substance expands between muscle fibers and hardens, though it does break down again in the body over time. Synthol, a legal drug in Russia, is seen by some bodybuilding enthusiasts as a better alternative to steroids, and can be injected into calves, quads, pecs and other muscle groups. Some of the risks attached to synthol use include nerve damage, skin problems, oil-filled cysts, muscle damage and the development of scar tissue, according to a 2015 research article in the Journal of Health Psychology.